You may remember that earlier this year I met photographer Daniel Thornton at the Preview to my exhibition at ‘the gallery on the corner’. After seeing the work he asked if he could come over to Irvine and take some film in the studio, which he did a few weeks later. As we got talking we realised that we had similar interests in wild places and although our approaches to our respective art forms is somewhat different, we are both using landscape as the basis for our work. Dan then joined us for a couple of walks in the hills. He was interested in seeing how Nita guided me on rough paths and open hillsides and on our first walk, in Glen Rosa on the Isle of Arran, he took quite a lot of film as well as recording a short interview between his friend David Feeney and I. It was during this walk that I told them about my plans to create a large drawing based on this glen. During our slow wander to the head of the glen and back, ideas of how I could develop the project were thrown around and I think that it was at the end of this walk that what at the start of the day had been just an idea, had by the close become a positive plan. Following this day, I gradually honed the idea further and in late August put a detailed proposal together to do the large drawing as part of an exhibition at the Harbour Arts Centre here in Irvine. They were very keen on the project and I’ve been offered the gallery for about two months late next year. This is perfect for me as it now gives me the whole of this winter to go back to Glen Rosa and start to really plan in more detail how I compose this large piece of work. Dan, who is based in Seattle, is currently back over in Scotland and on Wednesday he visited my studio again. After our walks in the spring he created a short 10 minute long film from the footage and recordings he made. ….if you haven’t already seen it then click on the link at the end of the blog. Apparently he’s had a good response to it and is now keen to develop this into a longer documentary piece. He asked whether Nita and I would be willing to spend several days with him so that he can shoot more footage. He is also very interested in using the drawing project as an integral part of the film. I’m very happy to do this as not only will it be a good way of promoting my work, it will be fun and very interesting too, especially as I’ll hopefully learn a lot more about Dan’s own work. As he was leaving Irvine on Wednesday evening to travel back to Edinburgh, he asked whether I could find any photos showing some of my early work along with any photographs from some of my early walks. 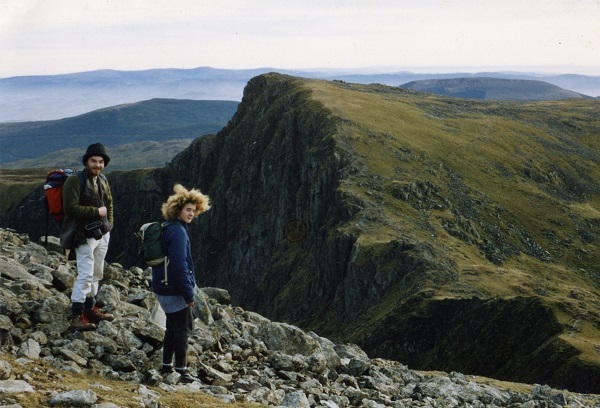 I don’t really have many such photos to hand but the one above is one taken by my friend Mervin, of Nita and I on Cada Indris in mid Wales in late December 1987 …this was one of the first proper mountain walks Nita had done …we’d only met back in the summer that year. Great hair, great hat, great day!!! Not sure if this is really what Dan is after but it made me laugh when I found it! To see Dan’s short film ‘Walking with Keith’, follow the link below..